What does a Jewish holiday for trees and Martin Luther King, Jr. have in common? A lot, actually. The former celebrates the life of trees, and the latter celebrates the life of an influential American civil rights leader. Both holidays are commemorated by giving back to the earth and our communities — so it’s a pretty cool opportunity for a cultural mashup and a prime “teaching moment” you can share with your little ones. 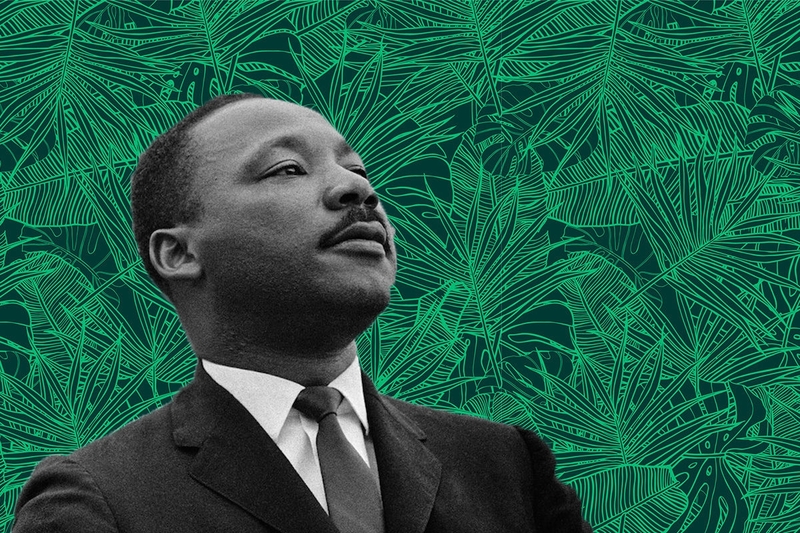 So, here are five ways to simultaneously celebrate the Jewish Earth Day and the legacy of Martin Luther King, Jr.
There’s an incredible website that facilitates community service called DoSomething.org, which is perfect for this year’s joint Tu Bishvat-MLK day. Sign up to host a “Planting Par-tay” to start or spruce up community garden with your friends and family, or plant a seed bomb (a variety of seeds rolled in a mud ball). This year, California was hit with its deadliest wildfire season. The devastating Camp Fire lasted 17 days, and burned 153,000 acres of Butte County. Needless to say, California could use a green hand. The organization OneTreePlanted has pledged to plant one tree for every dollar donated to help restore Californian’s displaced by the state’s natural disaster. Making donations to organizations that support Jews is a mitzvah — but don’t forget that many Jewish organizations offer opportunities to do community service that benefits people outside the tribe. For example, the UJA-Federation of New York organizes community service opportunities for New Yorkers through its Time for Good initiative. You and your family can volunteer to hand out groceries to those in need, stock food pantries with fresh produce, or plant gardens. On Tu Bishvat, Jews nosh on fruit popular in Israel, like dates, pomegranates, and olives (yes, olives are a fruit). You can usher in the trees’ new year and fight hunger by donating fruit to those in need. The Fruit Guys have donated over 8 million servings of fresh fruit across the country, and you can help their mission by donating a fruit box to a local charity. It’s customary for Jews across the world to plant trees in Israel for newborns, or as a bar/bat mitzvah gift. This year, IsraelTrees.org is asking donors to consider planting a tree in the Jewish state in memory of the victims of the horrific Pittsburgh Tree of Life synagogue massacre. But you’re not limited to Israel — you can also plant a tree in a U.S. National forest, too. Head to alivingtribute.com and learn how you can pay tribute to your family or friends and better the environment.